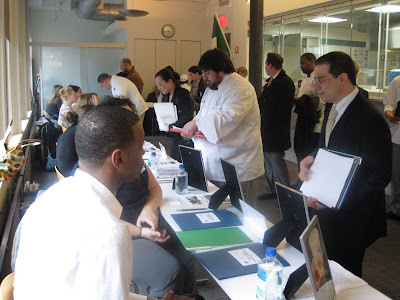 On Wednesday, March 23, the school opened its doors once again to some of the top restaurants, caterers, magazines and other food companies at our semi-annual career fair in New York City. 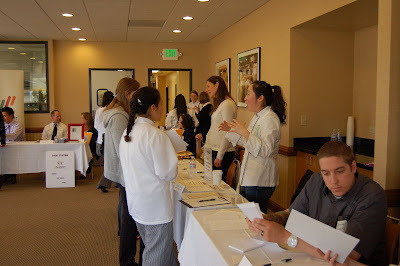 And as Chef Annette so aptly posted on her twitter account that day, "@frenchculinary career fair today. 5 years of former students & friends on both sides of the tables. I'm a very proud teacher today!" It's amazing to walk the halls and see such an impressive network of companies and students coming together for the benefit of both. Friends of the school and former students come back year after year, providing excellent opportunities for those students taking their turn at starting out fresh in the industry. The fair filled L'Ecole, the 4th floor classroom, and most of the 4th floor kitchens. 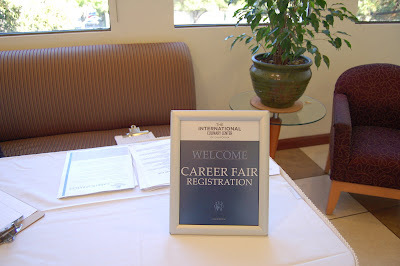 There was also an exciting addition to this year's career fair. On Monday, March 28, the school followed up our NYC career fair with one at our new California campus. The inaugural career fair went extremely well. Students and staff were both pleased with the employers who came to the school. The visiting employers were in turn impressed with the professionalism exhibited by the students. Foreground: Joey Elentario, executive chef of Mountain Views’s Michelin-starred restaurant, Chez TJ, reviews notes with his colleague. Middle: Deanna Kang, representative from Women Chefs & Restaurateurs, shares info. about the professional organization. Background: Emily Richard, director of Bumble, speaks to interested attendees about the new café and play space in downtown Los Altos. 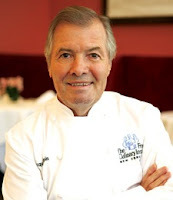 In May, The French Culinary Insitute begins its first run of week-long classes in our new Estate Management Studies training, headed up by former footman at Buckingham Palace and butler to Brooke Astor, Chris Ely, whose goal is to elevate the quality of professional service. In a whirlwind of media attention, Chris was interviewed in the New York Times and on Good Morning America this week. Read and watch, to learn more about Chris, our new EMS classes, and a few tidbits that we know you will want to use around your own "estate." 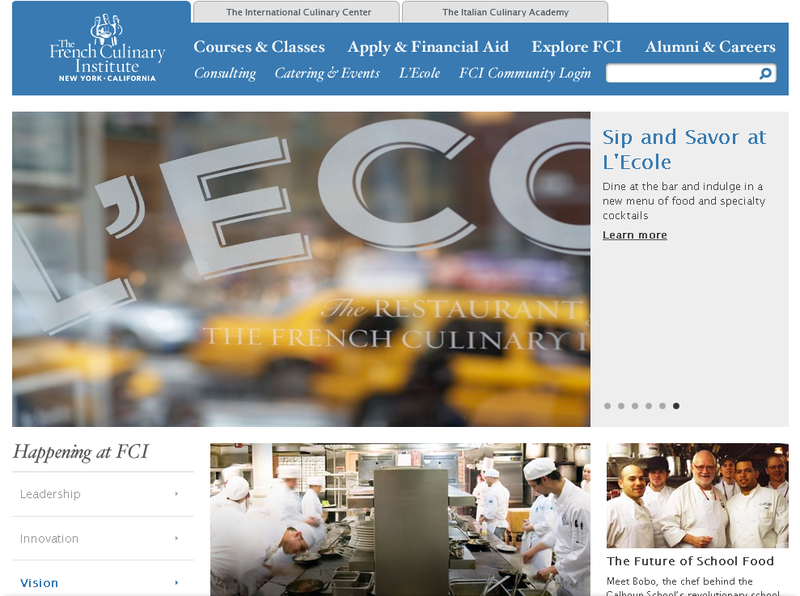 If you haven't heard the news already, The French Culinary Institute now has a campus in Campbell, California—just south of San Francisco. FCI career pastry and culinary programs will begin this April. Jacques Pépin, dean of special programs, cookbook author, and TV cooking show host, will be teaching a class for the inaugural Classic Culinary program, and Jaques Torres, dean of pastry arts and owner of Jacques Torres Chocolates in New York City, will be teaching a class for the inaugural Classic Pastry program. We also have two scholarships available for students attending these first two classes in April. We are excited to be able to expose our students to both the Bay Area and New York City, with their rich food cultures, and we look forward to becoming a strong participant in the food community in the Bay Area. Along with our new location, we also have a new website, which is chock-full of interesting tidbits: alumni bios, reports on events at the school, some of the interesting community endeavors we are participating in, and much more. The site is also easier to use and navigate. You can check out one of our many blogs for more in-depth coverage, too. We hope to keep you abreast of all the exciting things going on at both schoosl, as well as make it easy to get all the information you need on our many fantastic programs and areas of study. So, click around the new site. We think you will like it as much as we do! A childhood obesity epidemic has long been on the rise in America, and it’s become a problem we can no longer ignore. What began as a campaign less than a year ago has already reached thousands of schools. With a year in the works, from the White House to local schools nationwide, First Lady Michelle Obama launched the Let’s Move campaign last May to team up local chefs with school food programs. The two-day regional IACP conference organized by The Culinary Trust took place on February 18th and 19th. The first day opened with a plenary session at the Players Theatre in the West Village with guest speaker Sam Kass, private chef to our nation’s First Family and senior policy advisor for Healthy Food Initiatives. Motivated as a culinary professional and mother of two young children, I attended several sessions to find out what I can do to help the Initiative. With the amount of press in the room, we could have been attending a White House press conference. Childhood obesity statistics continue to rise, and so everyone wanted to know where can we find the solution? According to Chef Bobo, the problem didn’t originate in schools. However, the solution can certainly begin there. The home-based diet of a child has an enduring impact on their lifestyle. Parents can help by making smarter food choices, spending valuable time cooking meals in lieu of frozen dinners or takeout. I recently met Dr. M. Baer, a doctor of Nutrigenomics, University of Cambridge, who recommends a diet based on individual metabolic type and that eating the right foods can determine the remedy to genetic disease prevention. He believes the consumption of organic, sustainable foods versus conventional processed foods is better overall for longevity and disease prevention. Conventional foods are loaded with “toxins” that “attack and destroy cells and gene structures. They create an acidic environment in the body that is vulnerable to fungi, bacteria, parasites, worms, viruses, and many other pathogens. Organs and body systems under a toxic load lose their ability to metabolize and process fat effectively,” hence contributing to the obesity factor. So what is the solution to the childhood obesity epidemic? There is no solid answer. However, it will take more than just buying and cooking local, sustainable foods. It’s easier said than done, and certainly easier when money is not an issue. With the rising cost of produce, how will low-income families provide healthier alternatives at home? Walmart is taking steps toward offering compatible pricing for whole-grain products. Whole Foods Market is organizing on-location cooking demos at stores nationwide. In Washington, D.C., local public schools are receiving a $.05 bonus for each meal prepared, utilizing local sustainable ingredients. That’s good for starters. Of course any long-term solution to the childhood obesity epidemic will take a few years to show tangible results. 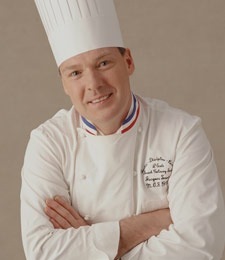 We as chefs have the power to enrich the lives of children by educating them how to eat well. Remember the old saying, We are what we eat? After attending the conference, I went home and registered to participate in the Initiative online. If we can get children to cheer for broccoli and try cauliflower, the Let’s Move Initiative looks very promising indeed. 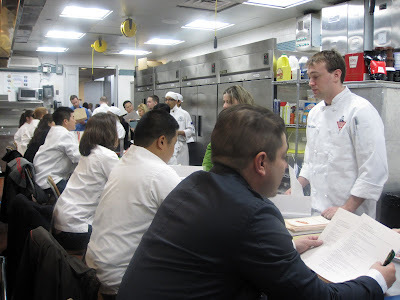 Notable attendees included: Sam Kass, Corby Kummer, Shelly Menaged from the James Beard Foundation, Mark Oshima from Citarella, Judith Weinbrow, Mike Thelin of Bolted Services, Karin Endy, Phil Gutensohn, Tony Garcia, Bill Telepan, Marion Rosenfeld, Chef Bobo. FCI note: If you are interesting in doing more, the school is offering a 10-hour course, New Directions in School Meal Planning instructed by Chef Bobo on May 7th. Rina Oh is an evening student in the classic culinary arts program and is a contributing writer on Eat Life FCI, The Hot Plate and Food2. When she's not working as a food writer or stylist, she continues developing content for her gossip blog, dining with outlaws, and illustrating a comic book series called The Gastronomic Chronicles.